As one of the most successful, productive academic emergency medicine programs in the country, the U-M Department of Emergency Medicine’s research capacity has flourished in the last decade. And now, with a hub of activity located at NCRC, momentum is picking up thanks to synergy with research across campus. The Acute Care Health Services Research Unit: Led by Mahshid Abir, this virtual, multi-disciplinary research unit is focused on research related to the continuum of acute care delivery, from pre-hospital to inpatient. The group researches all aspects of acute care delivery, including access, capacity cost, efficiency, utilization, and outcomes. Michigan Center for Integrative Research in Critical Care (MCIRCC): Kevin Ward leads a research group that brings together scientists, clinicians, engineers, and industry partners to develop and deploy cutting-edge solutions that elevate the care, outcomes, and quality of life of critically ill and injured patients and their families. Michigan Emergency Department Improvement Collaborative (MEDIC): A statewide consortium, led by Keith Kocher, is working to advance the science and quality of emergency care through collaboration with hospital emergency departments across the state. MEDIC is sponsored by Blue Cross Blue Shield of Michigan and Blue Care Network. University of Michigan Injury Center: This CDC-funded research program is dedicated to reducing injury through research and education. Led by Rebecca Cunningham, the group focuses on prescription drug overdose, concussion, violence, transportation safety, and sexual violence. It is one of only nine CDC-funded injury centers in the country. In addition, a number of individual EM investigators, including Drs. Scott VanEpps, Frederick Korley, Robert Neumar, Tulasi Jinka, and M. Hakam Tiba, occupy lab space in Building 26, where they are advancing their research in the areas of stroke and critical care. Individually, each group provides national and regional leadership in its field, and each is known for its multidisciplinary research approach. And what is the one thing they all say about the value of being located at NCRC? That their co-location with other groups facilitates interdisciplinary research collaboration that would not be possible elsewhere. U-M has the most highly NIH-funded emergency medicine department for research in the U.S. In fact, it receives 12% of the NIH’s emergency medicine funding. EM research spans from prevention research to state-of-the-science critical care research in its new EC3 unit. Five U-M Emergency Medicine researchers are among the top 50 most highly NIH-funded emergency medicine researchers in the country. U-M Emergency Medicine leads and participates in large national clinical trial networks (NETT, PECARN, StrokeNet, PETAL) and leads the only CDC-funded injury control research center housed in an emergency medicine environment. In celebration of the department’s expansive research, EM research groups, along with clinical faculty, other research faculty, fellows, residents, and staff recently convened at the department’s inaugural William G. Barsan Emergency Medicine Research Forum, named for the department’s founding chair. Held at NCRC, the event drew 118 attendees interested in learning about the outstanding research being done by the EM team. 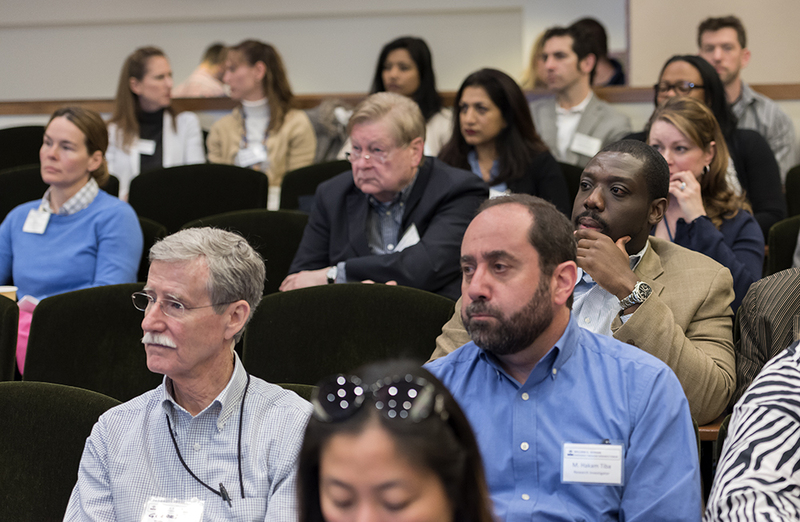 The day featured a keynote address by Dr. Barsan and presentations by 14 faculty, residents, and fellows; a poster session highlighted work from 35 research projects.